Pilar talks to Shannon Hughes, Senior Director of Marketing of Udemy, the largest marketplace for online courses. We talk about the how learning is being incorporated into busy schedules, how the corporate world is changing how they train their people and the shift in mindset necessary to take advantage of this new way of learning. 12.43 Shannon introduces Udemy and the story of its founder. 16.30 What people are seeking to learn and how the way in which we interact with online learning is changing. 26.00 Udemy for Business and how corporate learning is evolving. 39.50 Pilar introduces her own Udemy course on Leadership and Change. What does "completion" really mean? We're applying the framework of traditional education to this new modality of education, and this is not always relevant. Today’s episode is dedicated to one aspect of online learning, in particular to Udemy, which is a marketplace for online courses, and to tell us how the company is evolving and how the way in which we look at developing our skills is changing, today’s interview is with Shannon Hughes, who’s the Senior Director of marketing of Udemy. Now online learning has definitely exploded in the past, I don’t know, two or three years. You might have heard of MOOCs, Massive Open Online Courses, which are in essence, online courses that have been designed to take a very large number of students. 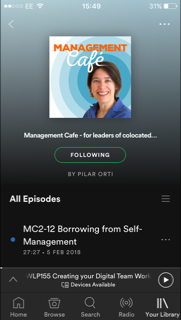 You might have come across Coursera, which I’m a great fan of and which I mentioned in the episode on Values, I think it was. Coursera was set up by two people from Stanford University and their courses are free although they have paid options to achieve a verified certificate of achievement, which they call a signature track, and they are now introduction other paid options. But in essence, Coursera, like EdEx or Future Learn in the UK usually offers academic-type courses, from academic institutions. Udemy is a little bit different. The focus is not so much on academic studies, although you can also find that type of course there, but there is more focus on vocational training, on practical material and also, the subjects go way beyond anything you might associate with the word, study. When I was browsing today, I came across a course on finding your perfect date, there are courses for learning instruments, there’s a big offer around online marketing, entrepreneurship, there are courses on programming, languages, pet care.. I don’t know, I think that if you have an idea for a course or if you think that there’s something out there you want to or need to learn, Udemy is bound to have a course up there for you. And the reason why the catalogue is so huge is that it’s a portal for instructors to create their own courses. I often think of MOOCs and online learning as the 21st Century equivalent of distance learning, which has been around for a while, of course, in the UK for example through the Open University. And having taken quite some few of these courses, both through Udemy and some of the academic platforms, I think, and Shannon Hughes reminds me of this in the interview, that we are really just seeing the beginning of this new way of learning. Most of these courses have at their core, material which is very similar to what you would expect to find in a university lecture. In fact, some of the courses I’ve taken through Coursera are basically a lecturer talking to camera and using a whiteboard, or tech equivalent, to make notes, show slides etc. There are then of course some forums but these have so many people making comments that I finding a bit overwhelming and to be honest, I rarely use them. I have however, come across some quite innovative courses which I think are making full use of technology. There’s in particular one on the Coursera platform on Social Psychology offered by Scott Plous, through Wesleyan University which did an excellent job of mixing theory, slides, videos and, in particular, some in-lecture surveys. What I really liked was that at the beginning of the course, you had to fill in a snapshot quiz asking you questions relating to human behaviour, like “Social judgments made during the first minute of meeting a stranger are not usually reliable and accurate” or “Compared with men, women are usually faster to fall in love and slower to end a relationship.” True or False. Then, when you came to play the lectures covering these topics, the course would remind you of your previous answers. I thought this was a very clever way of seeing how your thinking changed throughout the course. It gave me a clear idea of how the course material, which was of course made mainly up of research in the field of psychology, was giving me new frames of references and helping me to see social behaviour in a different way. I have a particular interest in how online learning might be involving, not just as learner but also as instructor, or, and I think I prefer the term, facilitator of learning. I am currently in the early stages of designing of course to help people leading virtual teams and also those working in virtual teams, and most of my thinking time is being spent trying to figure out what the best ways are of helping learning and discovering, beyond the presentation of material. I think there is still a long way to go to really use technology to help structured learning, but we’re getting there, we’re getting there. In fact, Shannon, in today’s interview, makes some really interesting points about this and how the way in which Udemy is set up and evolving is helping to do this. In doing a bit of research about how online learning is evolving, I also came across the article"Will MOOCs be Flukes. Why MOOCs are failing the people they're supposed to help." in the New Yorker, from November 2014, about how MOOCs are failing to deliver on this absolutely new way of democratizing education, not just because of the kind of people who end up taking the courses, which are usually people who already have a degree, but also because the way in which they’re delivered seems quite inflexible. I also find interesting in the article that the author talks about, or the research she quotes talks about, people who “did their best” or who “passed”, which, when you think about it, is still quite an old-fashioned way of looking at adult education. Shannon also has some good points to make about this – what does “completing a course” mean, when we might be enrolling in courses for a wide range of reasons. Personally, I’ve completed quite a few of the Coursera courses, “completed” meaning I’ve watched all the video lectures and even taken the end of week quizzes, but haven’t done any of the coursework. However, I’m applying some of the stuff I’ve learnt quite regularly and I’ve taken one or two concepts per course that are really helping me move forwards, but does anyone have any record of me being “successful” on the course? I think, to be honest, that this question of what does it mean to be successful as a student, and how do we measure someone’s understanding of a subject is quite an old question, but one that I think is important to address as we move forwards into designing learning programmes using new technologies. So, back to today’s episode, which has Udemy as a specific example of how people are currently using technology for teaching and learning. I can’t quite remember how I came across the platform but when I saw how easy it was to create a course for it, and, more than anything, how little technical work I needed to do for this, it became of interest to me. What I mean with this is that all I needed to do was to create the materials and upload them. Udemy then takes care of presenting them in a nice interface, with discussion boards, the lectures and sections are presented neatly, it just looks good. What I was also very impressed by was the fact that they have two Facebook groups to help the instructors and potential instructors create their courses, share experiences, give feedback and promote their courses. The communities are very well moderated and so they’re very useful. But what really made me think, wow these guys care about what they do, were two things. One is that last year in 2013, for Christmas, we got, and by we I mean the instructors, we got a Christmas card in the post. How amazing is that. All the way from the states, I received an actual Christmas card. And then during Easter, when they started to really push what was then called Udemy for Organisations which is now called Udemy for Business, I got a personal email asking if I wanted my course about leadership and change to be included in the catalogue and then, Shannon gave me a call, an actual telephone call, to talk to me about what Udemy for Business was all about, the kind of courses they were including, how it would work, etc. I was so impressed, I’m not sure how many instructors they were asking to join, probably about 100 if not more, and to receive a phone call from the Director of Marketing, to me, meant a lot. So, I had no hesitancy in dropping her a note to see whether she fancied coming on the podcast. During this chat, she gives us an overview of where online learning seems to be heading in general and how the courses offered by udemy reflect what’s going on in the market, where people think their skills gaps are, and more specifically how corporate learning is changing. The point I found most interesting that in order to make the most out of this kind of learning, both as students and instructors, we need to change our mindset of what learning is and how we consume these kind of materials. Of course, we’re already changing how we learn and the fact that many companies have incorporated online collaboration tools to help their staff connect shows that (and I’ll be speaking to Marta from yammer in a couple of episodes), shows that the mindset is already shifting, but we’re just at the beginning of a very interesting, and exciting journey.